We have made some progress in designing a new website to plot all the drifter tracks and to serve the data but we have not yet released it. It will take the place of the rather cluttered site: http://www.nefsc.noaa.gov/drifter/ before the 2010 drifter season gets underway in a few months. Tanya Stoyanova, a computer science student from Bulgaria, is working on it one day per week. Figure 1. Example of comparing an observed drifter track (blue) with simulated forecast tracks (other colors). 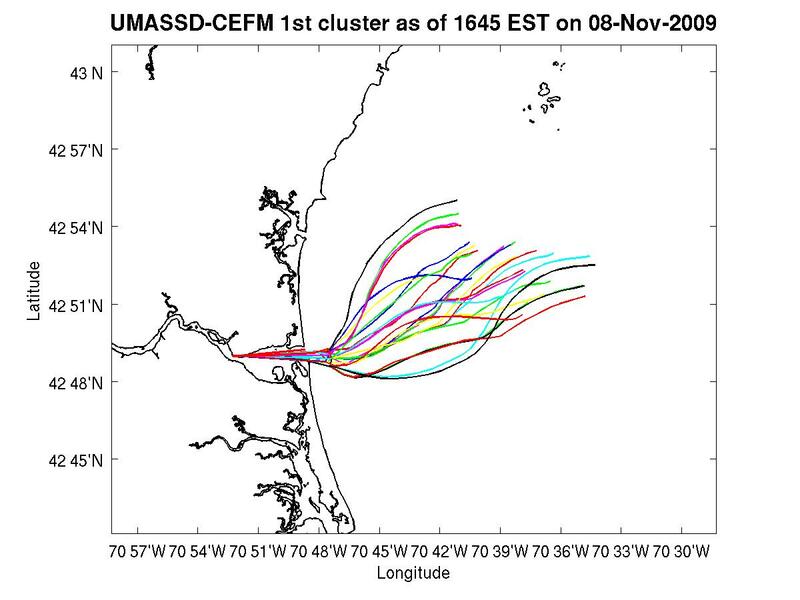 In this case, we are using the UMASS-Dartmouth’s FVCOM model output on the “GOM2 grid” provided on the web. We are developing a routine to track particles through their 3-d velocity fields. Working with SMCC and UMASS-D, we provided the USCG with one of our drifters which they deployed off of Cape Elizabeth Maine in mid-January 2010 (see Fig 1). This was part of the USCG Search and Rescue Training Operations where they practice some of their routines following drifting objects over the coarse of several days. Since we have similar interests for scientific reason (such as following patches of toxic algae), we are trying to combine our efforts in this endeavor. Animation of these forecasts vs observed tracks are linked from the drifter website but may be found directly is at, for example: http://www.nefsc.noaa.gov/drifter/fvcom_sarops.html. If you are interested in implementing this sort of forecast operation in your waters, let us know. All you need is to find a URL for some webserved “CF-compliant” circulation output in your local waters and a MATLAB programmer. Ari Daniel Shapiro’s interview with us including a trip to Casco Bay to deploy drifters was released last week and posted on the COSEE NOW website where it will be heard by many educators and their students around the country. It can be found at http://coseenow.net/podcast/2010/02/drifter/. We are happy to add Long Beach Community College from California, Clatsop Community College from Washington State, and the Atlantic Salmon Federation from New Brunswick, Canada to the list of drifter users. 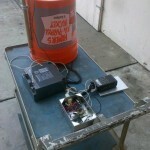 LBCC students are actively designing new rigs to radio track bucket drifters in Los Angeles river runoff events. CCC students are following their surface drifters (rachels) rapidly moving north and east of their deployment location off Astoria. ASF will be deploying several drifters in the St Lawrence River in May to track the potential transport of young smolts. We are watching the development of various transmitters such as the new “Spot2” come on the market. There are a variety of options available “off-the-shelf” for doing our sort of tracking but we are sticking to the TrackPack II in 2010. Given its increased battery power this year and improve circuitry, we are hoping it will serve our needs. We will see. Figure 2. Approximate location, institution, #, purpose, principal investigator, and month of SMCC/eMOLT drifter deployments planned for 2010 on the northeast continental shelf. 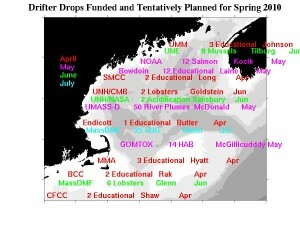 More than 100 drifter deployments will be made this year (Fig 2) to document flow patterns around the Gulf of Maine. Most of the deployments this year will be made in Massachusetts Bay. The state has funded a project, for example, to investigate the potential effects of the LNG facility on the lobster population. We will deploy dozens of drifters in the coastal waters north and south of Boston Harbor. Some of the drifters for this project will be put together by the Center for Student Coastal Research in Cohassett, MA. In exchange for their efforts, they will get several drifters of their own to deploy in their local harbor to examine the exchange mechanisms with the bay. Our satellite service-provider has recently instituted a new policy. Those of you who get billed directly (or plan to get billed directly in the future) now need to fill out a one-time “business agreement form”. 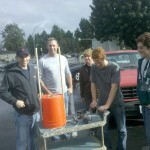 If you haven’t already done so and you plan to deploy drifters in 2010, please let me know. I will email a copy of this form partially filled out for you to fax or email to ComTech Inc. Note: Those of you funded by the MATE project do not have to worry about this until your “message count” exceeds a few thousand. You can see your message count on the 8th column of the sensservice.com spreadsheet. Dan McDonald and his crew from UMASS Dartmouth successfully deployed 26 bucket drifters off the mouth of the Merrimack River (Newburyport, MA) on Nov 7th after a large runoff event. All units, many of them fitted with additional sensors (temp, salinity, GPS, high-powered strobes), worked well and were successfully recovered after being quickly expelled into the open ocean. See figures below with stacked buckets and their tracks on the ocean. 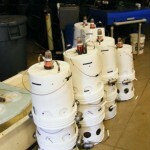 SMCC-built bucket drifters stacked in the lab. The buckets float upside-down with only an inch or two above the waterline. I spent an afternoon on Buzzards Bay with Ruben Davis of Datissystems Inc of Catamet, MA a few weeks ago. Ruben, a retired electronic engineer, has devised a radio-tracked GPS drifter that can be monitored from a laptop on board or at a base station ashore. He demonstrated the successful operation of his prototype and plans to work on expanding the range capabilities of these units this winter. So, those of you interested in near-shore applications that are free of satellite costs, let me know. Some of you had trouble accessing and viewing the kml files. They are linked from the www.nefsc.noaa.gov/drifter site under the “drogue depth” column of the 2nd table. Please note that the best way to do this is to click on the link and then “viewèpage source” on the upper toolbar of your browser. This is the file you input to GoogleEarth. If your track does not have a kml file linked, or you have trouble viewing it, call my cell at 508-566-4080 or email james.manning@noaa.gov . Some of you have had trouble obtaining more drifter parts that are NOT sold in most hardware/marinas. The buoy sticks and toggles (ie flotation component attached to the end of the fiberglass spars), for example, are sold specifically in Maine for the lobster and herring fishermen, respectively. For help in obtaining these parts, you may contact erin@gomlf.org. We have two proposals in the works that include drifter deployments. One is a small part of the Northeast Regional Associations of Coastal Ocean Observing Systems (NERACOOS) request to the 2010 NOAA IOOS. While we do not have much hope that it will be funded, we have nevertheless suggested routine deployments by fishermen at selected sites around the Gulf of Maine throughout the HAB season (Apr-Sep). 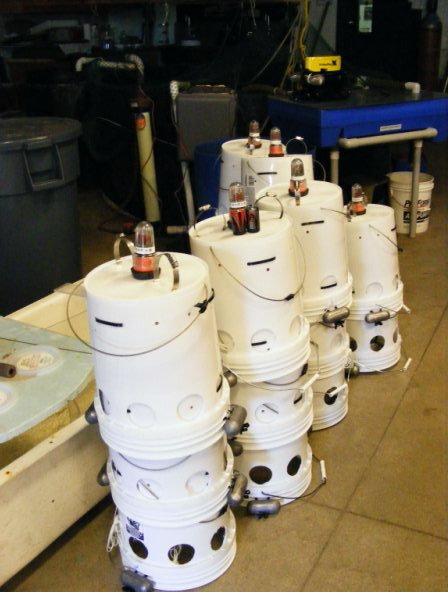 Another proposal, in the early stages of development, is a follow-up to the eMOLT project in 2004 where, similar to the NERACOOS objective, lobstermen deploy student-made instrumentation around the Northeast region to obtain data for the purposes of validating numerical simulations. If any of you are interested in similar proposals in your region, let me know. I’ll send you a copy. If you have other ideas for drifter proposals, let’s hear them! For an entertaining read about things that float in the ocean look up “Flotsametrics and the floating world”. For more technical discussions on the science of things floating in the ocean see “Lagrangian Analysis and Prediction of Coastal and Ocean Dynamics”. There has been some discussion about what “2-part marine urethane foam” to use when filling the PVC pipe. While SMCC suggests “Poly-U-Foam” (available on line for about $40/quart), there are probably other types in smaller qquantities that will do the job. US Composites sells a “4-lb kit” for about $20 (catalog # “FOAM-0204”). In fact, as Jason Hyatt (Mass Maritime) suggest, we MAY be able to get by with a can of “Great Stuff” from your local hardware but we do not know yet how well this will hold up in seawater. Note that we did not use any foam at all for the first few years we deployed drifters. We only added this extra buoyancy within the pipe in hopes that the transmitter stays afloat despite the inevitable loss of the other flotation. 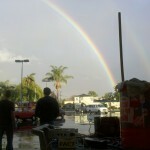 Thanks to our colleagues at MATE, you can follow a blog of drifter experiences at: http://coseenow.net/mate/ . To make an entry in the blog, click on the “Register” link , “Log in”, and blog away. Note that they already have a set of “categories” to choose from including, for example, “curriculum development”, “collaborating with scientists”, etc. Under the “resources” page, there is a link back to the various SMCC/GoMLF/NOAA effort. I plan to enter this newsletter in their “Tracking the Drifter” blog. We have compiled a gallery of drifter photos (linked from the bottom of the “drifter construction and technology” document at http://www.nefsc.noaa.gov/drifter/ ) and may harvest some more from the blog. Please send your contributions to james.manning@noaa.gov (or upload them to the blog) and supply the photographer’s name so that we can give the proper credit. There are always particular tracks that stands out from the rest. This month, the Cape Fear Community College drifters have provided some interesting tracks. 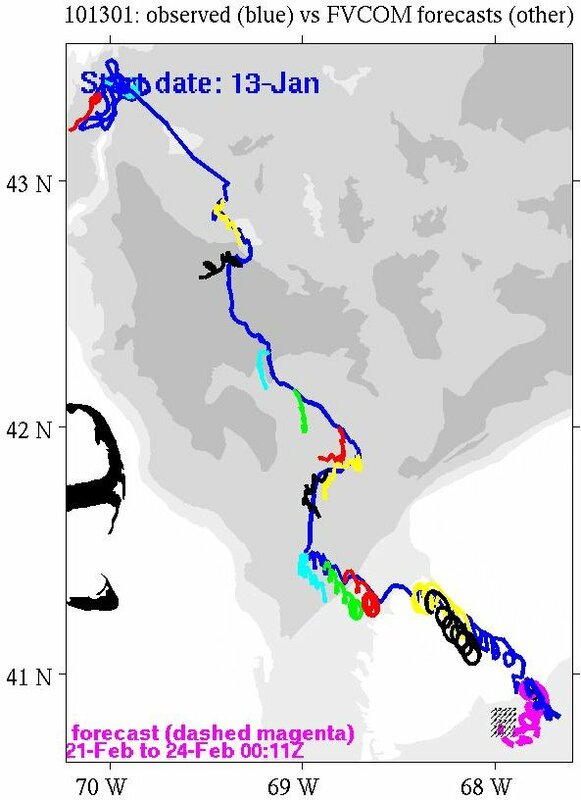 Their first drifter that was deployed just a few weeks ago has traveled over 2000 kilometers in the Gulf Stream but, even more amazing, their 2nd drifter traveled over hundred kilometers in one direction, turned around and came directly back nearly to where it started. CFCC is now working on building more drifters and some of the students are designing a wooden (ie biodegradable) drifter! Two new-style drifters will be deployed within the next few weeks. One is the “Kathleen” bucket drifter which will track the very-near surface waters of the Merrimack River Plume for Dr. Dan McDonald of UMASS Dartmouth. Many of these units have powerful strobes, Garmin receivers, temperature and salinity sensors installed along with the TrackPacks. There will be a total of 27 units deployed at the river mouth during an outgoing tide after a large runoff event. Stay tuned. 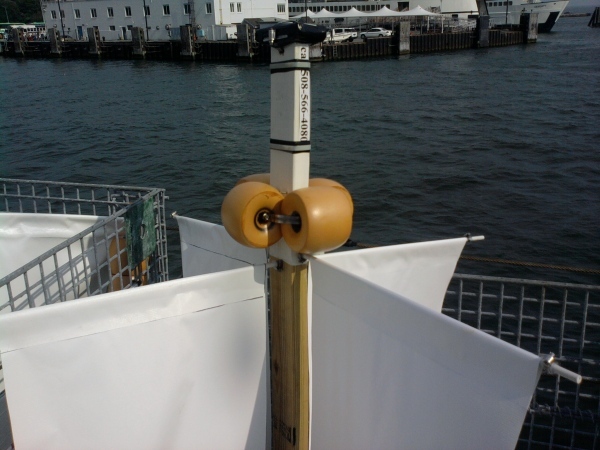 The other new style drifter, developed recently by Ruben Davis of DatisSystems of N. Falmouth, MA, eliminates the need for satellite transmissions by implementing a radio-based system for near-shore high resolution applications. Stay tuned for the result of these prototypes. 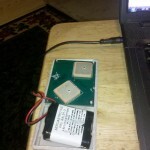 Jason Goldstein and Win Watson (UNH) have come across the TrackStick. Google this and you will see a compact device that may be a nice alternative to the Garmin units (for internal storage of fixes) and apparently provides more battery life. This is the first of what I imagine to be a nearmonthly “newsletter” on drifter issues. Now that there are a few dozen labs using the SMCC/eMOLT drifters, we should probably try to compile our notes. If you have anything you would like to share with others (photos, funny stories, bad experiences, etc), please send it along to james.manning@noaa.gov. 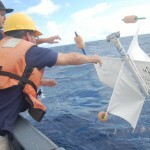 Keep in mind that most of the information regarding the drifters is now linked from the realtime website http://www.nefsc.noaa.gov/drifter but these periodic newsletters will provide your information on “what’s new”. If you want to be removed from the mailing list or you want some of your colleagues to be added, let me know. This first issue is going out to all users that have deployed, or plan to deploy, this fall. Given that the transmitter technology is constantly evolving and not all of these units work flawlessly, it is a good idea to set your transmitter outside the day before you deploy it under a clear sky view to make sure you are getting good fixes. Set transmitters outdoors after shutting them off to verify they are indeed off. Those of you who were at the workshop in August should put your transmitters outdoors to make sure they were properly turned off. 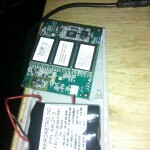 There was at least one case where the transmitter was left on which probably resulted in a 2030% battery loss. A transmitter makes 3 attempts to get a fix with each sampling period so, if it is hidden from the satellite, the battery will run down 3times faster. We recovered several fiberglass rods this summer which, after having been at sea for a multiple weeks, were worn down at the point of contact with the plastic buoy stick. This might have been due to the holes in the buoy sticks being two small so that they didn’t swing easily with wave movement. In our quest to minimize the cost of drifters, we recently started using heavy cable ties to secure the transmitters (where we used stainless hose clamps in the past). Last month, there was at least one documented case of the cable tie breaking. While this may have been due to the unit crashing on the rocks, it is worth noting nevertheless. If you experience any faults like this, PLEASE let us know. We are very excited to have expanded the use of these drifters around the country thanks to a NSF funded workshop in August where nine schools each went home with two drifters. As noted on the realtime site, UMaine Machias and Cape Fear CC, for example, have already made deployments. One of the links under the realtime website allows you to document your deployment. Based on the information you enter it is suppose to give you the “deployment ID”. If you want to know this deployment ID BEFORE you deploy, see the “deployment ID convention” link that is under the “construction and technology” notes. Please keep in mind that these websites are constantly under development in our attempts to automate things as much as possible.